Do you like crazy racing games with other people? Race against friends in this two player driving game! Take your chance to become the legendary street racer! 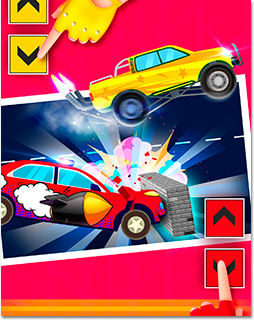 Burn the asphalt at extreme speeds with turbo sports car, monster truck, police car and many more. Collect power-ups to sabotage your rival. Prove that you are the best racer in the world! Spectacular locations. Every level is an unforgettable adventure. Challenge your opponents to race on city streets, in deserts, industrial areas and futuristic surroundings. Win demolition derby races and open new tracks! Bonuses and power-ups. Collect unique bonuses that will help you to win the competition. Blow up the rival’s car, froze it for some time, but be careful! – don’t let the opponent to catch you in a trap. Be the first who grabs the shield or first aid kit to protect your car from any damages that your vicious rival plans to cause. This multiplayer car crash racing game is absolutely crazy! Two game modes to satisfy your need for speed. Test your skills in arcade mode or challenge your friend in the 2-player mode. Set of cars. 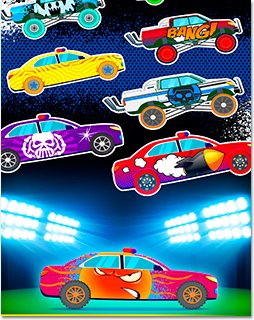 Go to the garage with super cool vehicles: racing car, monster truck and police car. Tuning and improvements. Use the earned stars to improve your vehicle to stay ahead of your rivals. * A collection of vehicles to choose from: formula speed race cars, offroader and police car. 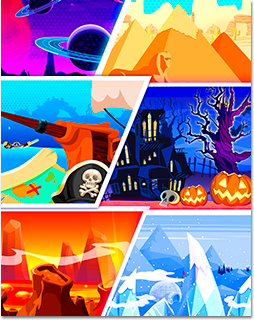 More vehicles are coming! * Build your car in the garage to customize your dream car to your personal taste! * The app is also good for small kids under 5 years.